An initial cosmological singularity… forms a past temporal extremity to the universe. We cannot continue physical reasoning, or even the concept of spacetime, through such an extremity… On this view the big bang represents the creation event; the creation not only of all the matter and energy in the universe, but also of spacetime itself. Source: P. C. W. Davies, “Spacetime Singularities in Cosmology,” in The Study of Time III, ed. J. T. Fraser (Berlin: Springer Verlag ). [A]lmost everyone now believes that the universe, and time itself, had a beginning at the big bang. Source: Stephen Hawking and Roger Penrose, The Nature of Space and Time, The Isaac Newton Institute Series of Lectures (Princeton, N. J.: Princeton University Press, 1996), p. 20. So, there are several scientific discoveries that led scientists to accept the creation event, and one of the most interesting and famous is the discovery of how elements heavier than hydrogen were formed. The term nucleosynthesis refers to the formation of heavier elements, atomic nuclei with many protons and neutrons, from the fusion of lighter elements. The Big Bang theory predicts that the early universe was a very hot place. One second after the Big Bang, the temperature of the universe was roughly 10 billion degrees and was filled with a sea of neutrons, protons, electrons, anti-electrons (positrons), photons and neutrinos. As the universe cooled, the neutrons either decayed into protons and electrons or combined with protons to make deuterium (an isotope of hydrogen). During the first three minutes of the universe, most of the deuterium combined to make helium. Trace amounts of lithium were also produced at this time. This process of light element formation in the early universe is called “Big Bang nucleosynthesis” (BBN). The creation hypothesis predicts that there will be specific amounts of these light elements formed as the universe cools down. 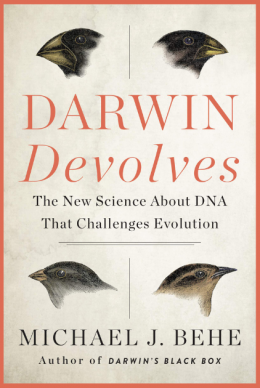 Do the predictions match with observations? 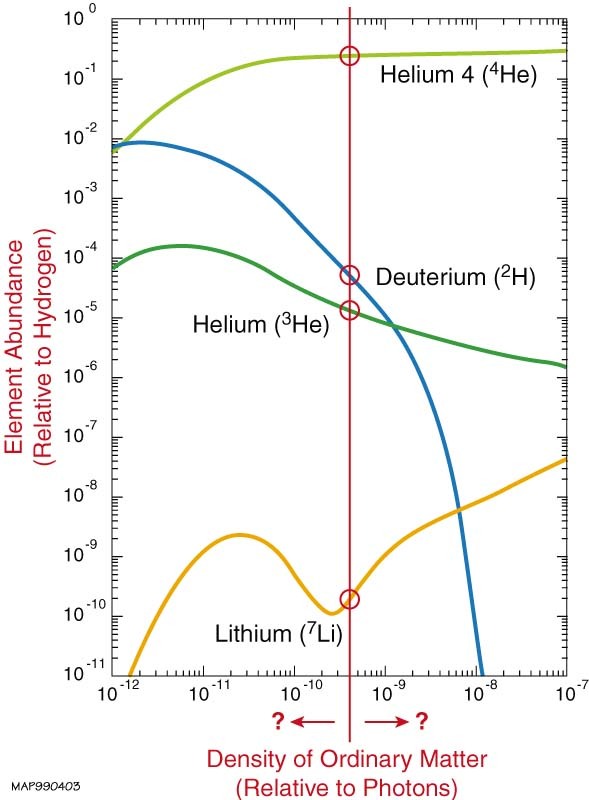 The predicted abundance of deuterium, helium and lithium depends on the density of ordinary matter in the early universe, as shown in the figure at left. These results indicate that the yield of helium is relatively insensitive to the abundance of ordinary matter, above a certain threshold. We generically expect about 24% of the ordinary matter in the universe to be helium produced in the Big Bang. This is in very good agreement with observations and is another major triumph for the Big Bang theory. Moreover, WMAP satellite measurements of mass density agree with our observations of these light element abundances. However, the Big Bang model can be tested further. Given a precise measurement of the abundance of ordinary matter, the predicted abundances of the other light elements becomes highly constrained. The WMAP satellite is able to directly measure the ordinary matter density and finds a value of 4.6% (±0.2%), indicated by the vertical red line in the graph. This leads to predicted abundances shown by the circles in the graph, which are in good agreement with observed abundances. This is an important and detailed test of nucleosynthesis and is further evidence in support of the Big Bang theory. “An important and detailed test”. Elements heavier than lithium are all synthesized in stars. During the late stages of stellar evolution, massive stars burn helium to carbon, oxygen, silicon, sulfur, and iron. Elements heavier than iron are produced in two ways: in the outer envelopes of super-giant stars and in the explosion of a supernovae. All carbon-based life on Earth is literally composed of stardust. That’s a wonderful thing to tell a young lady when you are on a date: “your body is made of stardust”. In fact, as I have argued before, this star formation, which creates the elements necessary for intelligent life, can only be built if the fundamental constants and quantities in the universe are finely-tuned. Now, you would think that atheists would be happy to find observations that confirm the origin of the universe out of nothing, but they are not. Actually, they are in denial. 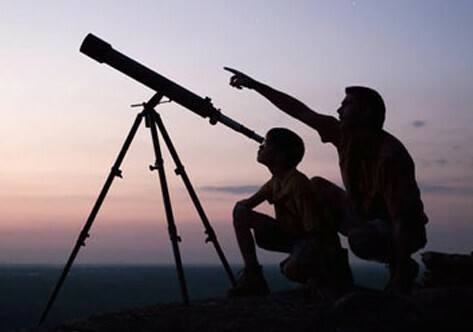 For a couple of examples of how atheistic scientists respond to the evidence for a cosmic beginning, you can check out this post, where we get responses from cosmologist Lawrence Krauss, and physical chemist Peter Atkins. You cannot have the creation of the universe be true AND a self-existing, eternal universe ALSO be true. Someone has to be wrong. Either the science is wrong, or the atheist manifesto is wrong. I know where I stand.